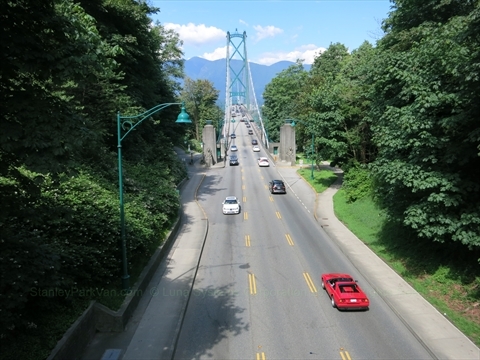 The Stanley Park Causeway is a major 3 lane highway that runs north-south through the middle of Stanley Park. It is used mainly as a commuter connection from Vancouver to North Vancouver and beyond. The causeway connects to the Lions Gate Bridge which connects North Vancouver to Stanley Park. 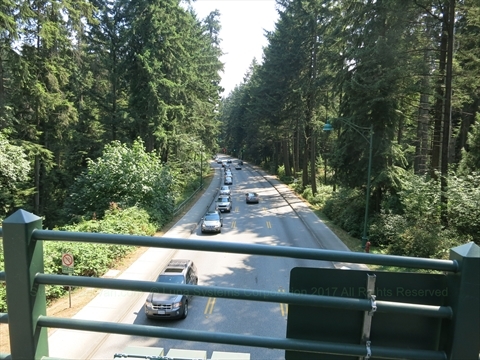 The Stanley Park Causeway is very busy during the morning and evening rush hours. 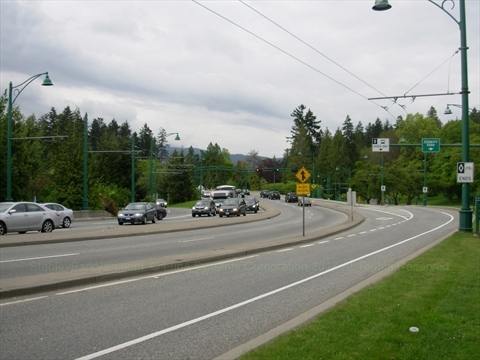 During rush hour, a counter-flow system is used whereby the middle lane has it's direction changed in order to manage the flow into and out of Vancouver and North Vancouver. So you would expect at times to have only 1 lane in the direction you are travelling. From Vancouver heading to North Vancouver, Georgia Street turns into the Stanley Park Causeway. The only other way to get onto the causeway is a small entrance off of Stanley Park Drive near Prospect Point. This entrance is closed from 3:30pm to 6:30pm on Weekdays. 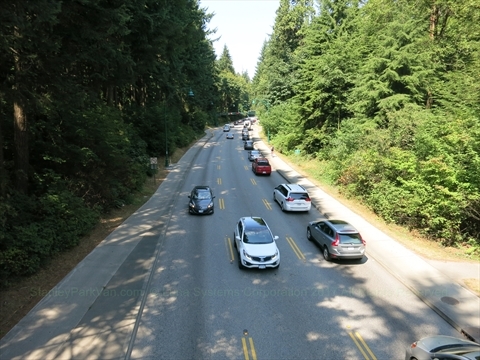 If you get onto the Stanley Park Causeway by accident and don't want to go over the bridge to North Vancouver there is one exit just before you reach the bridge where you can exit the causeway onto Stanley Park Drive. If you take this exit you will have to drive around half the park to get back to English Bay. From North Vancouver heading to Vancouver, there are exits from Marine Drive that lead to the Lions Gate Bridge which turns into the Stanley Park Causeway. There is only one exit just after you get into Stanley Park that you can take to get onto Stanley Park Drive. You would take this exit if you wanted to go to attractions on the west side of the park such as Prospect Point, Prospect Point Picnic Area, Hollow Tree, Third Beach, Teahouse Restaurant, Second Beach Outdoor Swimming Pool, Second Beach, or Ceperley Park. If you don't take this first exit you will end up on Georgia Street. Recently, the City of Vancouver put up fences along the sides of the causeway to prevent pedestrians and bicycles from going onto the lanes of the causeway. They also separated and clearly marked the bicycle and pedestrian lanes.